The late 19th century was an exciting time to be a tattooist in Europe and America. Foreign influences such as the beautiful and accomplished Japanese irezumi, combined with technological invention in the form of Samuel O’Reilly’s 1891 electric tattoo machine, and the patronage of royalty – traditionally the preserve of the fine arts – all coincided to inspire a generation of tattooists, who took advantage of a surge in the popularity of tattooing. Keen to elevate the status of the profession, Sutherland MacDonald, who had trained as an artist before coming to tattooing in 1890, coined the term ‘tattooist’, which he preferred over the more commonly used ‘tattooer’. According to Macdonald, ‘tattooist’ carried with it all the connotations of the title ‘artist’ that he wished to emulate, rather than the simple suggestion of a manual trade evoked by ‘tattooer’. The term stuck, and Macdonald is now considered to be one of the greatest tattooists of his era, as well as an early professional pioneer. in the British Medical Journal, May 4th, 1889. Not all 19th century observers took such a positive view of the practice, however. Some doctors in particular, warned of the potential health risks involved in tattooing. In medical journals, there was much discussion of the transmission of infectious diseases, such as tuberculosis and syphilis, via the unregulated and largely unhygienic practice of tattooing. In the early days of the professionalisation of tattooing, amateurs and semi-professionals in ports and barracks still outnumbered the ‘artists’ such as Macdonald, who were seeking to redefine the profession. The health risks were very real: it was not uncommon during this period for the amateur practitioner to use saliva to whet and mix their inks, or ‘clean’ the finished wound. The business cards of early 20th century tattooists often made a point of advertising the cleanliness of their studios and practices. 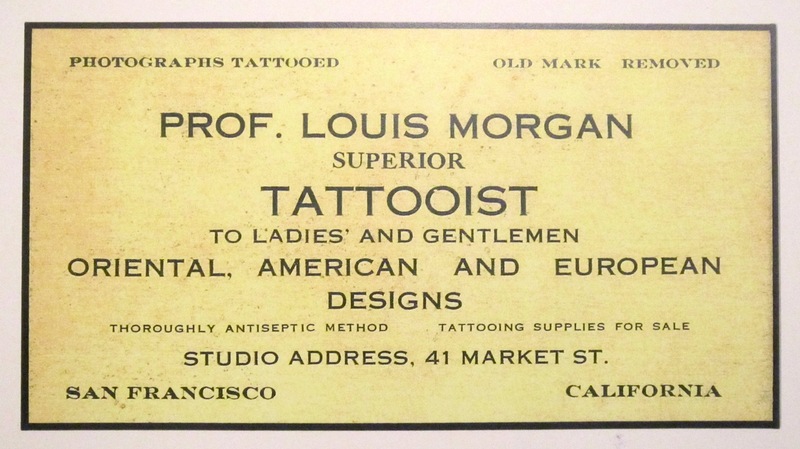 Louis Morgan’s own card (c.1912) clearly advertises his ‘Thoroughly Antiseptic Method’. Courtesy of the Tattoo Archive, Berkeley California. Old Randy in the arcade shop insisted that a tattoo cured syphilis. Possibly in his dim way he had heard of an article in the Journal of the American Medical Association stating that a syphilitic ulcer on a man’s arm, originating on his wrist and travelling upwards, was stopped dead when it reached the red pigment of a tattoo. No wonder: the red pigment was a spirocheticide – mercuric sulphide, one of the old specifics against syphilis before the days of penicillin. The presence of mercury in the skin was enough to arrest the progress of a shallow skin ulcer; after that, the bugs went undercover. Unfortunately, syphilis is once again becoming a serious health concern in Europe and the USA, with a sharp rise in the number of reported cases. Most recently in the UK, an increase in the number of syphilis cases amongst teenagers was reported in 2011, making the observation of sterilisation and hygiene practices in contemporary tattoo studios all the more relevant. Part of this post is an extract from Gemma Angel’s article, Atavistic Marks and Risky Practices: The Tattoo in Medico-Legal Debate, 1850-1950. Published in the forthcoming edited collection, A Medical History of Skin: Scratching the Surface. Available from Pickering Chatto, March 2013. F. R. Barker: ‘Notes Of Cases On An Outbreak Of Syphilis Following On Tattooing’, in British Medical Journal, 1:1479 (1889), pp. 985-989. Louis Morgan: The Modern Tattooist, Berkley: The Courier Publishing Company, (1912), pp. 59–60. Samuel Steward: Bad Boys and Tough Tattoos: A Social History of the Tattoo, with Gangs, Sailors and Street Corner Punks, 1950-1965, New York: Harrington Park Press, (1990), p.82. G. H. Belote: ‘Tattoo and Syphilis’, in Archives of Dermatology and Syphilology, Vol.18, No.2 (1928), p.203. Novy, Frederick G. JR., (Lieutenant Commander, U.S.N.R), ‘A Generalized Mercurial (Cinnabar) Reaction Following Tattooing’, in Archives of Dermatology and Syphilology, Vol.49, No.3 (Mar. 1944), pp.172-173. This entry was posted in History of Medicine, Museum Collections and tagged amateur tattoos, cinnabar, dermatology, health risks of tattooing, infectious diseases, Louis Morgan, Mutter Museum, sailor tattoos, skin disease, skin lesions, syphilis, tattoo inks. Bookmark the permalink.